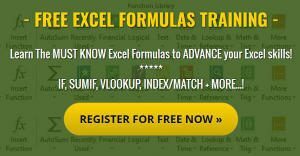 What is Excel’s IF Function? IF you empty the garbage AND mow the lawn AND wash the dishes AND walk the dog, you get your full allowance. And since I grew up in New England, this logic would change with the seasons to account for things like leaves and snow. 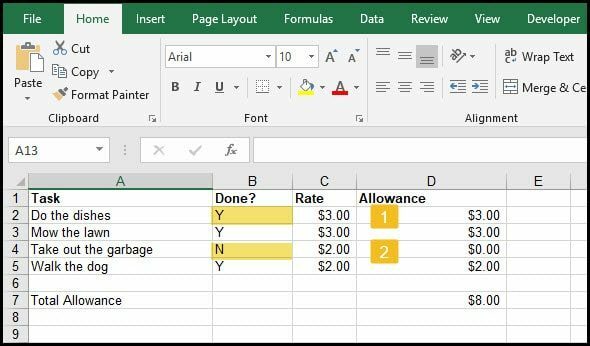 Although Excel can’t issue an allowance, it can calculate the amount using a logic test based on whether a cell met a formula condition. For example, I could create a spreadsheet with the tasks needed to get an allowance. If the task was completed, (TRUE situation) a value would be applied toward the allowance. If the task wasn’t completed, (FALSE situation), nothing would be added. These examples are noted by labels (1) and (2) in the screen snap below. IF cell B2 equals “Y” , then use the rate value in cell C2. IF cell B2 does not equal “Y”, then place 0 in cell D2. As you can see in this example, the IF logical condition is either TRUE or FALSE. And it pays to take out the garbage. Append the equals sign and your desired value in quotes. For example =”Y”. 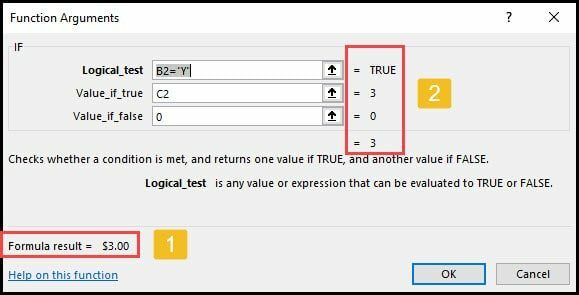 In the Value_if_true field, type the value you would like entered in your cell if B2 equals “Y”. In our example, I’ll click cell C3. 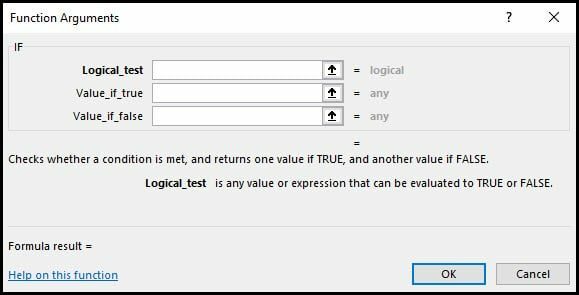 Review the dialog to see if the Formula result= value (label 1 below) is what you expect. If not, check to see if any errors show to the right of the fields (label 2 below). Copy the formula to the other cells in your column. The above spreadsheet might have been Version 1 for my parents. A new incentive program would appear based on some parent/child negotiations and competitive neighborhood rates. I probably would’ve fought for pay on partial tasks. No doubt, my parents would counter with a penalty clause if something was less than half done. 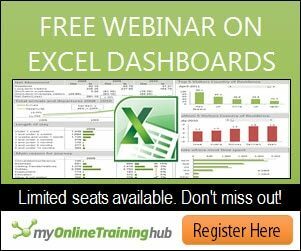 Excel is flexible when it comes to IF statements and can evaluate more than a simple “Y” or “N”. For example, if we convert our previous Done? column to a % Done column with a number, we can accommodate these new requirements. The new formula is basing the allowance off the % Done column. If the task completion number is greater than .5, a prorated amount was applied to the allowance. If the task completion rate was .5 or below, a negative amount was applied to the allowance. Loosely translated, a “half-assed” performance cost money. 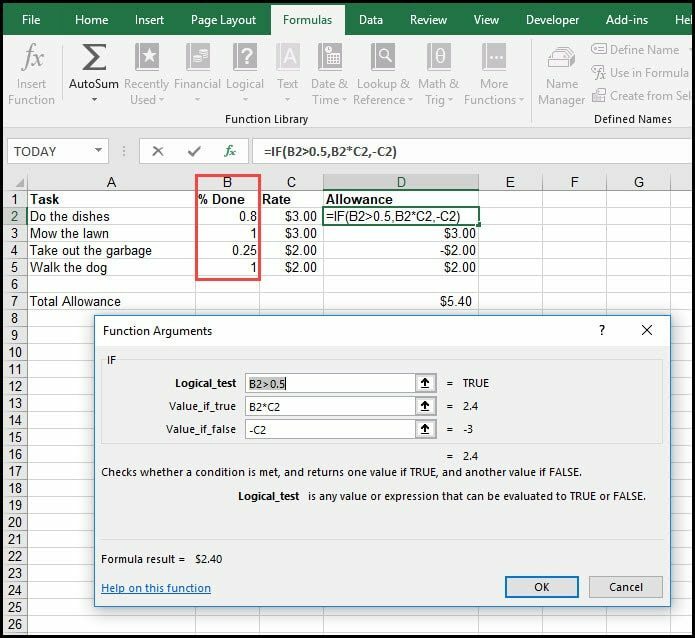 Excel’s IF function is a versatile and useful function. Once you get the hang of it, you’ll start using it in more scenarios. The two examples presented here were foundational. But you can use IF functions to handle other transactions such as applying sales tax, shipping charges, fixing Excel DIV 0 errors or even nested IF functions with Boolean logic. And if you have kids, let them build the Excel spreadsheet and give them a bonus for using the IF function.